The Cited Scientists project summarizes TPU publication activity in 2018. The positive dynamics of publication activity is proved with the increase of the number of publications in the Q1 and Q2 highly rated journals and the citation of articles. In 2018, 1,740 articles were published in Scopus that exceeds the numbers of 2017 by 1.5 times. In 2018, 540 articles of Q1 and Q2 were added to TPU Articles Register, compared to 443 in 2017, and the number of articles with IF > 1 was 605 in 2018, compared to 518 in 2017. There is also an increase in the proportion of articles coauthored with scientists with H index = 5 and more. In 2018 it was 36 % compared to 28% in 2017. In addition, the number of articles doubled in the Nature group journals (Nature Index) from 6 (in 2017) to 11 (in 2018). First Observation of a Baryonic Bs0 Decay — R. Aaij, B. Adeva, M. Adinolfi, Z. Ajaltouni, S. Akar, J. Albrecht, F. Alessio, M. Alexander, S. Ali, G. Alkhazov et al. The article was published in the Physical Review Letters, Q1. Observation of tt¯H Production — A.M. Sirunyan, A. Tumasyan, W. Adam, F. Ambrogi, E. Asilar, T. Bergauer, J. Brandstetter, M. Dragicevic, J. Erö et al. The research was published in the Physical Review Letters, Q1. Massive remobilization of permafrost carbon during post-glacial warming — T. Tesi, F. Muschitiello, R.H. Smittenberg, M. Jakobsson, J.E. Vonk, P. Hill, A. Andersson, N. Kirchner, R. Noormets, O. Dudarev, I. Semiletov, Ö. Gustafsson. The article was published in Nature Communications, Q1. In December 2018, the most highly cited coauthor of TPU scientists has H-index 54, the most highly rated journal has IF 6.29. Andrey Malyshev, SRF at Research Laboratory for Electronics, Semiconductors and Dielectrics, Anna Petrova, JRF at Research Laboratory for Electronics, Semiconductors and Dielectrics, Anatoli Surzhikov, head of the Division for Testing and Diagnostics of the School of Non-Destructive Testing, principal researcher at Research Laboratory for Electronics, Semiconductors and Dielectrics. 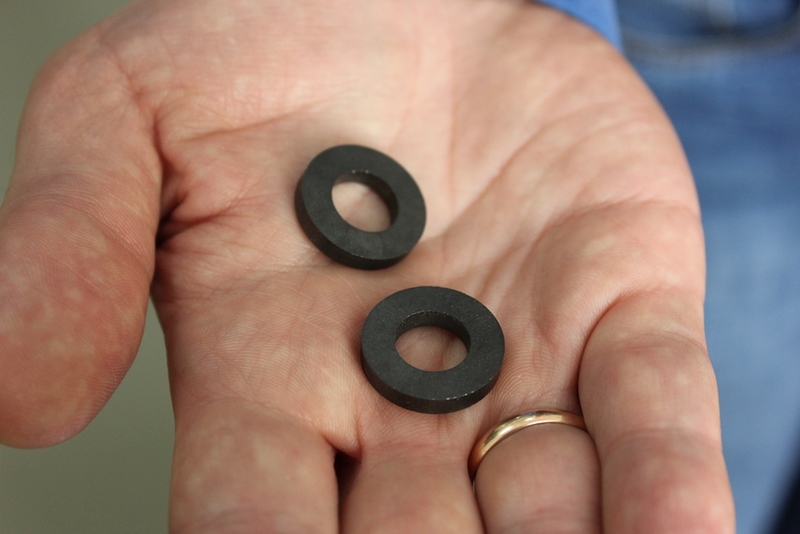 In the present work, the results of the influence of diamagnetic additives on the defects level of ferrite ceramics, its microstructure and magnetic properties are presented. A method based on a mathematical analysis of the experimental temperature dependences of the initial permeability was used for estimation of the defects level in the samples. 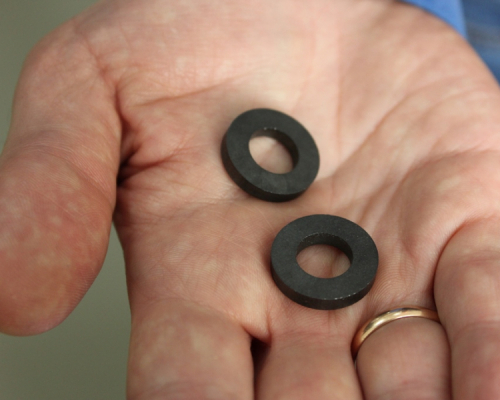 Model samples containing a controlled amount of the diamagnetic additive Al2O3 served to test the possibility of monitoring this method of nonmagnetic phases of ferrite ceramics. It was shown that with an increase in the concentration of the Al2O3 additive in the range of (0–0.5) wt%, a significant increase in the defects level was observed almost 6-fold. 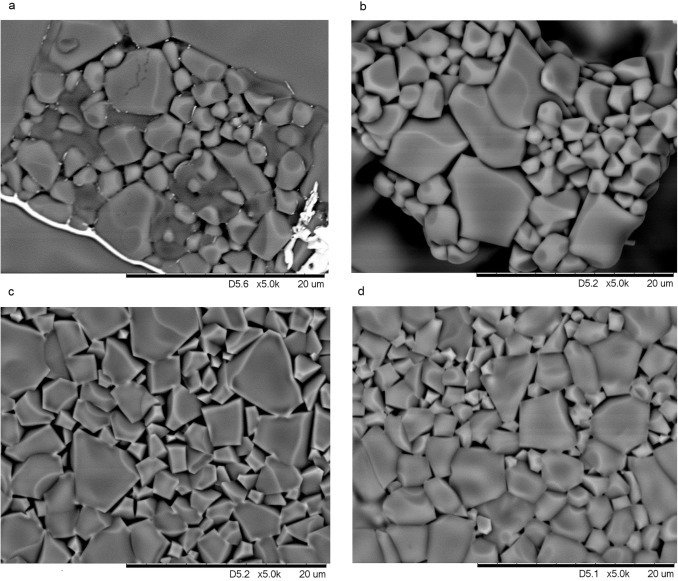 The data from SEM micrographs showed that the addition of Al2O3 affects the type of grains of ferrite ceramics, but does not affect their grain size. Grains are highly agglomerated and show large grain size dispersion and also pore. Obtained data were compared to hysteresis loop parameters. It is shown that with an increase in the concentration of the Al2O3 addition, there is a regular decrease in the residual induction and an increase in the coercive force. However, such changes in hysteresis loop parameters are small in comparison to defects level. Investigations of the true physical broadening of the diffraction reflections were performed for the same model samples in order to compare the change in the defects level to the direct X-ray diffraction measurements of micro deformations. The defects level as a characteristic of the elastic stress of a ferrite ceramics is proposed. This assumption follows from a linear relationship between the defects level and the width of the diffraction reflections. The consistency of the obtained results made it possible to evaluate the high efficiency and sensitivity of the method for defects level estimating. Nikolai Antonenko, a professor from the Division for Experimental Physics, Vazgen Sargsyan (H-index 17), Sergei Grigoriev, Gurgen Adamyan (H-index 34) from Joint Institute for Nuclear Research. A code was described to calculate the capture cross section in the collisions of two nuclei at energies below and above the Coulomb barrier. As shown, the code and approach itself allow us to describe well the available experimental data. The code is well verified by numerous comparison its results with the experimental data. The program allows us to consider the collisions of deformed nuclei and take into account 2n-transfer channel. The main part of the program is realized with C++. Besides the values defined in the code, there are possibilities to perform calculations with user defined parameters. There is a friendly user interface on the webpage. Alexey Pestryakov, a professor at the Research School of Chemistry & Applied Biomedical Technologies, Evgeniy Khramov, Yan Zubavichus (H-index 27) from National Research Center ‘Kurchatov Institute’, Juan Carlos García-Ramos (H-index 10), Center for Nanoscience and Nanotechnology, Mexico, Julia Kotolevich, Nina Bogdanchikova (H-index 30) from National Autonomous University of Mexico. Influence of modification with metals Au and Ag, oxides of Fe, Mg and Ce and their combinations on amorphization of widely used commercial nanosized TiO2 (Degussa P25) was studied with SR-XRD and EXAFS methods. These systems were chosen taking into account their potential on catalytic properties for biomass to biodiesel transformation, as it was shown in model reaction of liquid phase n-octanol oxidation as well as low-temperature CO oxidation for “cold start” of the neutralizers of car exhaust gases. Instability of rutile, the most stable TiO2 phase, in the presence of the additives was found. Application of EXAFS method, rarely used for crystalline structure transfer studies, led to elucidation of this apparent effect, which was explained by higher level of amorphization of rutile than anatase. Literature data indicate that bulky TiO2 doping leads to either increase of rutile/anatase ratio complete inhibition of anatase to rutile transformation. Dissimilar phase composition changes, revealed in this work for modified nanodispersed TiO2, was attributed to size effect. Svetlana Shkarina, a research engineer at the Research Center for Physical Materials Science and Composite Materials, Maria Surmeneva, SRF at Research Center for Physical Materials Science and Composite Materials, Roman Surmenev, director of Research Center for Physical Materials Science and Composite Materials, Elizaveta Melnik from TPU, Gabriele Vacun (H-index 20) from Fraunhofer Institute for Interfacial Engineering and Biotechnology, IGB (Germany), Roman Shkarin, Venera Weinhardt, Tilo Baumbach, (H-index 33) from Karlsruhe Institute of Technology (Germany), Epple Matthias (H-index 54), Loza, K.I. (H-index 10), the University of Duisburg-Essen (Germany), Kluger Petra (H-index 12), Reutlingen University (Germany), Sergei Ivlev from Philipps-Universität Marburg (Germany). Akira Yoshimura, a professor at the Research School of Chemistry & Applied Biomedical Sciences, Michael T. Shea, Olga Guselnikova, an engineer at the Research School of Chemistry & Applied Biomedical Sciences, Pavel Postnikov, an associate professor at the Research School of Chemistry & Applied Biomedical Sciences, Mekhman S. Yusubov, SRF, director of Research School of Chemistry & Applied Biomedical Sciences, Victor Nemykine (H-index 38) from the University of Manitoba, Shea Michael T., Gregory T. Rohde (H-index 10), Akio Saito (H-index 25) from Tokyo University of Agriculture and Technology, and Viktor V. Zhdankin (H-index 46). Phenol based aryliodonium salts were prepared by the reaction of [hydroxy(tosyloxy)iodo]arenes with aryl silyl ethers in the presence of trifluoromethanesulfonic acid. Structures of several aryliodonium salts with the hydroxy group in the para-position of the phenyl ring were established by single crystal X-ray crystallography. Under basic conditions, 4-hydroxyphenyl(phenyl)iodonium salts form a dimeric hypervalent iodine(III) complex, oxyphenyl(phenyl)iodonium ylidic salt, the solid structure of which was confirmed by X-ray crystallography. Phenolic iodonium salts are potentially useful phenol transfer reagents in reactions with various anionic nucleophiles. The interaction observed between two surfaces in contact with one another is part of a number of physical processes, such as wear. In this paper, we present a numerical study of the asperities between two surfaces in contact with each other. 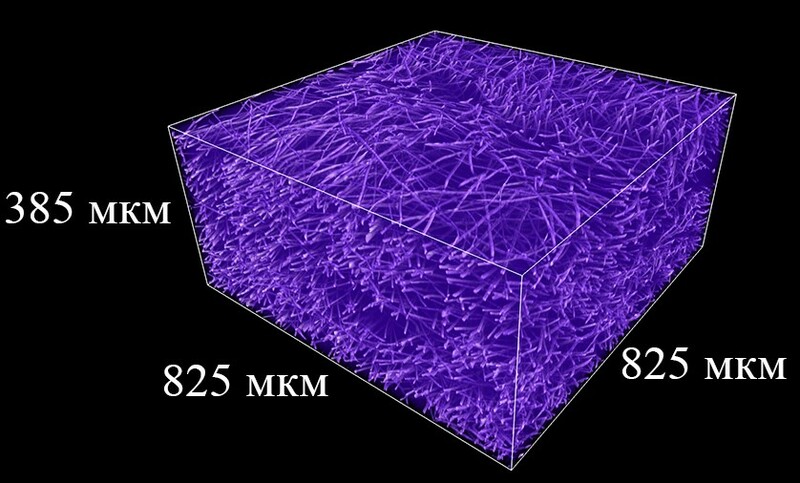 The real contact area between two surfaces varies due to the multiple roughness scales caused by the stochastic nature of asperities. In our research, we employ a tribological system comprising two partitions: C1 is the contact set (CS), where the two surfaces are in direct contact with each other, and C2 is the noncontact set, where the two surfaces are not in contact with each other. Here, we have developed a new numerical model to describe the CS using ε-entropy to prove the existence of a minimum value for entropy in sliding contact scenarios. In this system, the lower and upper bounds of entropy are determined through the Kolmogorov approach using the aforementioned model. Using this model, we conclude that the ε-entropy value is bound between ln 2 and 2·ln 2 for a tribological system comprising two partitions. Additionally, we conclude that a correlation between the stochastic tribological contact behavior and the rate of entropy change is the key parameter in thermal nonequilibrium scenarios. Vladimir Ovcharenko, a professor from the Division for Industrial Technologies, head of the Laboratory for Composite Materials of the Institute of Strengths Physics and Materials Science SB RAS, Vasily Klimenov, a professor, head of the Division for Materials Science of the TPU School of Advanced Manufacturing Technologies, Konstantin Ivanov, the Institute of Strengths Physics and Materials Science SB RAS, Oleg Lapshin, Tomsk Science Center SB RAS. The work studies the effect of argon, krypton and xenon used for pulsed electron irradiation in gas discharge plasma on structure formation, microhardness, wear resistance and friction coefficient of surface layers of 50%TiC/50%(Ni–20%Cr) cermet composite. The paper theoretically shows the decrease in ionization energy of plasma gas increasing the temperature and heating depth of the surface layer of a cermet composite. Experiments have established that the application of heavier plasma gases with lower ionization energy increases the depth of the layer where dissolution of TiC particles occurs, boosts wear resistance and microhardness, lowers the friction coefficient on the cermet composite surface. This article considers the evolution of the professional librarian from a collection-centered liaison librarian to a service-oriented, embedded specialist. It analyzes the competencies required to provide embedded library services and describes a process for establishing an embedded librarian model in a university library in an "Expert Librarian" project. Examples of services and products that libraries could provide are suggested. The article also discusses the possible transformation of embedded librarians into providers of a service known as knowledge process outsourcing.